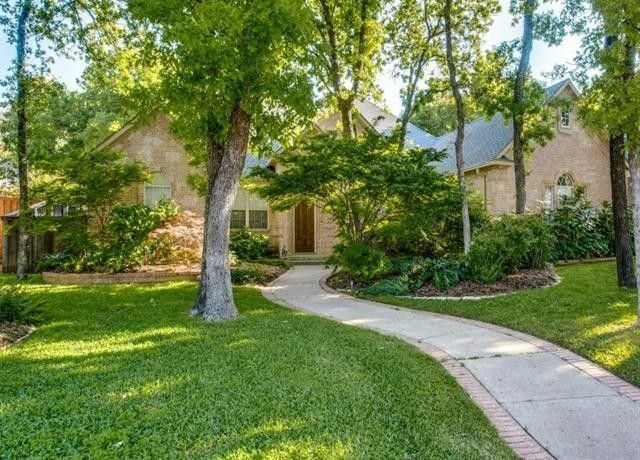 This custom brick single-story home sits beautifully on a landscaped wooded 1/3 acre lot shaded with dogwood and oak trees and a 32x11 covered patio overlooking the serene backyard. The spacious 3,148 square foot home includes two bedrooms plus a study, two and half bathrooms, two spacious living areas, and two dining areas. The foyer opens to the music room with archways and to the left, pocket doors open to the study with custom built bookcases in the home office or library. Gleaming wood floors and archways enhance the elegance of the formal living area with a double-sided fireplace shared with the greatroom. The 22x16 greatroom features custom built-in cabinets and a wall of windows with a view of the private backyard. The recently updated kitchen offers an island and breakfast bar with stainless appliances including a Bosch double-oven (convection), a Thermador five-burner gas cooktop, and a built-in microwave—all open to the breakfast area and dining area. The secluded master suite offers a romantic fireplace and sitting area and includes a luxurious master bath with a double vanity, dressing table, a jetted tub, a separate shower, and a walk-in closet with a customized closet system. Overlooking the landscaped backyard, the secluded guest suite has an adjacent full bathroom. Huge three-car garage, double driveway, and excellent storage in the 25x16 upstairs unfinished bonus room above the garage. Directions: Off I-35E, take the Teasley Lane exit south. Take a right onto Hobson Lane at the traffic light. Turn left onto Forrestridge Drive. Turn right onto Royal Oaks Circle, which is a horseshoe street. Sign in the front yard.